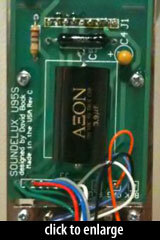 The U95S was marketed as an upgrade of Soundelux’ former flagship tube condenser, the U95. Both were multipattern large-diaphragm tube mics. The U95S introduced a new capsule, a new transformer, and a new tube. The retail price was 80% higher. The U95S incorporated a custom-made transformer by Jensen. According to MIX, it was purposefully oversized to deliver very clean output. 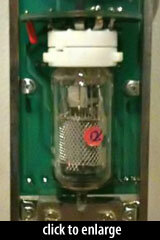 The 6072 dual-triode tube of the U95 was replaced in the ‘S’ by a Russian EF86 pentode, sometimes also called a 6267 tube. In the U95S, the tube was wired as a triode, which allowed it to produce very linear output as compared with most triodes. The review mic sent to MIX used a Svetlana 6267/EF86; it has better shielding and linearity than conventional EF86 tubes. The capsule was a K47 copy manufactured by BLUE. Presumably this was Blue’s B7 capsule — a single-backplate, center-terminated design with dual 6-micron 24mm diaphragms on a 34mm shared backplate. The U95S exterior metalwork and grille were manufactured by 797 Audio in China. The mics were assembled and tested in Hollywood, California. David Bock has stated that the first production run of 100 U95S microphones was manufactured in China by 797 Audio, but the mics were subsequently rebuilt in the US due to poor quality control at the factory. 797 Audio subsequently released a mic called the U95S. It was entirely a different microphone from the Soundelux mic of the same name — as far as we can tell, it shared only a name and a color scheme with the original U95S. The 797 version had a Chinese-sourced circuit, capsule, transformer, and tube. Even the physical dimensions appear to be different. The Soundelux E95S shipped with a padded wooden storage box, a “Spyder” elastic shockmount, a spare EF86 tube, the tube power supply, and a flight case. I directly compared the mic to the best of my classic Telefunken U47 mics that use the same capsule design. At identical gains, the noise was noticeably lower, with no signs of popping or sputtering. In session on vocals, the sound was enormous. It comes as no surprise that this is not a neutral mic.